Three fights were televised on the undercard of tonight’s offering by Top Rank from Macau, China. All three fights went the distance and as a result, the undercard didn’t end until midnight and Manny Pacquiao had to wait to get warmed up for his fight. The Venetian in Macao had a paid attendance of 13,202 and the purses for tonight’s card was $25 million for Manny Pacquiao and $1.67 million for Chris Algieri. Melody Thornton sung the national anthem for the United States and the World Choir sung the Filipino national anthem. Chris Algieri walked out first into the ring and received little to no reaction from the crowd while Pacquiao was greeted by a loud and enthusiastic roar. Michael Buffer did the fighter introductions. The following is a round by round account of the WBO Welterweight Title Fight between Manny Pacquiao (56-5) and Chris Algieri (20-0). Pacquiao and Algieri meet in the center of the ring and Algieri is active with his jab early on. Algieri also looks to be a lot taller than Pacquiao in this ring. Pacquiao lands an early left cross and follows it up with two shots to the body. Algieri is keeping his jab in the face of Pacquiao and Pacquiao lands a decent right hook on Algieri. Pacquiao with a right to the body of Algieri. Pacquiao lands a good left cross. The crowd is reacting to every punch that Pacquiao throws. The crowd is loudly chanting for Pacquiao while Algieri is showing a lot of side to side movement. Pacquiao is showing his lightning quick hand speed this round while Algieri is backing up and trying to catch Pacquiao in a fight. Pacquiao lands a good right hook to the body and Algieri lands a straight right lead. 10-9 Pacquiao. Algieri is active with his jab early on in the second round. Algieri lands a good jab on Pacquiao. Pacquiao lands a two punch combination but has to chase Algieri. Pacquiao throwing combinations and makes Algieri move. Algieri goes down from a straight left hand but may have slipped on a wet spot in the ring. Pacquiao leads with a straight left to Algieri’s nose. Pacquiao is chasing Algieri and lands a good left cross. Pacquiao is showing a lot of aggression this round. Good straight right hand by Algieri. 10-8 Pacquiao, 20-17 Pacquiao. Replay showed that the knockdown by Pacquiao was clearly a slip. Pacuqiao has Algieri backing up from his combinations even when he blocks his punches. Algieri comes forward with a four punch combination and lands a right hook. Algieri barely misses with a lead left hook. Pacquiao is chasing Algieri recklessly around the ring. Pacquiao lands a good left hook and tcouhes Algieri with a jab. Algieri lands a good jab on Pacquiao. Pacquiao reaches and barely misses with a left cross. Pacuqiao with three shots to the body and two punches upstairs. Pacuqiao lands a left cross and Algieri connects with a right cross. Pacquiao with a good right hook as the round comes near an end. 10-9 Pacquiao, 30-26 Pacquiao. Algieri comes out a little more aggressive at the start of the fourth round but then goes back to staying active with his jab. Algieri throws to the body of Pacquiao. Pacquiao lands a good lead left hand to the chin of Algieri. Pacquiao with another two punch combination. But Algieri is doing a pretty good job at moving away after Pacquiao lands. Pacquiao barely misses with a stragith left hand but follows it up with an uppercut near the middle of the ring. Pacuqiao throws two hard shots to the body of Algieri. Algieri lands a good straight right hand on Pacquiao. Algieri lands a good straight right hand. Algieri is showing good head movement but Pacquiao lands a good left hand. Algieri does connect with a right hand lead near the end of the round. 10-9 Pacquiao, 40-35 Pacquiao. Algieri throws a right to the body and follows it up with a right hand upstairs. Algieri pressing forward a little more this round. Algieri connects with a right cross on the chin of Pacquiao. Algieri lands another jab on Pacquiao. Pacquiao reaches for a left hand but is a little short. Algieri connects with a good right cross to the body of Pacquiao. Pacquiao connects with a good counter straight left hand but Algieri follows it with a right hand. Algieri connects with another right to the body and then a straight right hand followed by a left hook. Algieri is boxing pretty well this round. 10-9 Algieri, 49-45 Pacquiao. Algieri had his best round of the night the last round. Pacquiao throws a straight left hand but it is blocked. Algieri throws a right cross and is blocked by Pacquiao. Pacquiao lands a good left cross on Algieri. Pacquiao lands a good left hook on Algieri and waited for him to open up from a defensive position. Pacquiao lands a good right jab on Algieri. Algieri with a good right to the body but gets warned for a low blow. Pacquiao lands a good straight left hand that stunds Algieri and he goes to the mat and does a back flip. This was a much cleaner knockdown than last time. Algieri gets back to his feet and Pacquiao is chasing him around the ring. Algieri goes down for the second time but his foot may have slipped in the same spot as the first round. Pacquiao is stalking Algieri but eats a straight right hand. Algieri stays on his horse for the rest of the round but survives. 10-7 Pacquiao, 59-52 Pacquiao. Replay showed the second knockdown of the round was from a straight jab to Algieri’s chin. Algieri is active with his jab and his crosses to the body of Pacquiao. Pacquiao lands a good straight left hand. Algieri is bouncing on his feet and is able to land an uppercut to the body of Pacquiao. Pacquiao lands a straight left hand but Algieri connects with an over the top right hand. Pacquiao thuds Algieri with a three punch combination in the middle of the ring. Pacquiao punches his gloves together as if to urge Algieri to fight. Pacquiao snaps Algieri’s head with a solid jab. Algieri with a good hard body shot on Pacquiao. 10-9 Pacquiao, 69-61 Pacquiao. Pacquiao opens up the eighth round with a quick two punch combination immediately after touching gloves. Pacquiao lands a good straight left hand that snaps the head of Algieri. Pacquiao with a good right jab. Algieri is pawing his jab in the face of Pacquiao but really unable to throw any power shots. Pacquiao comes forward and lands good two punch combination. Pacquiao is starting to throw his double left cross. Pacquiao lands a good counter straight left hand. Algieri hits Pacquiao with a counter right hand after Pacquiao throws a punch to the body. Algieri with a quick left hook. Pacquiao looks like he hasn’t lost a step with his hand speed at thirty five years old. Algieri with a good stiff jab. 10-9 Pacquiao, 79-70 Pacquiao. Algieri goes immediately to the body of Pacquiao. Pacquiao comes forward with a good two punch combination. Pacquiao lands a good lead left cross to the chin of Algieri. Algieri with a good jab and Pacquiao barely misses with a hard left counter. Algieri connects with a good right counter. Pacquiao follows that up with a good right hook counter on Algieri. Algieri lands a right hook left jab combination. Pacquiao lands a vicious straight left hand just as Algieri’s trainer was saying he was going to knock Pacquiao out the next round and Algieri looks hurt still. He gets up at the count of nine. Pacquiao follows it up and pounds on him by the ropes. Algieri takes a knee and the referee counts to nine again. Pacquiao lands combination on Algieriby the ropes and throws combinations. 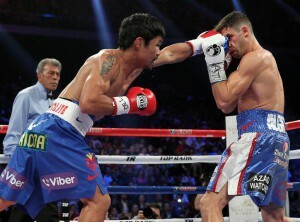 Algieri looks wobbly but Pacquiao unleashes his combinations as the round ends. 10-7 Pacquiao, 89-77 Pacquiao. Manny Pacquiao does a little Ali shuffle as the fight comes to an end but he had a lopsided and impressive decision victory over Chris Algieri. The judges scored the bout 119-103, 119-103, and 120-102 for Manny Pacquiao.